Tired of not seeing certain effects in raids? Having trouble looking at the boss to see if he's about to do a mechanic? Or are you just lazy and want something to do most of the work for you? Then this is the addon you seek! Never be caught offguard so you can put your focus on things that are more important. Originally created by Silentgecko this addon started out with a few alerts but has since grown to huge proportion. Ranging for alerts that let you know there's a certain effect on you to alerts that warn you about an incoming hit. It's almost as if you can see into the future! Now of course there are still things you will need to look out for yourself but hopefully Raid Notifier will ease some of the burden. If you are interested on the timing of certain bosses and their abilities I highly recommened Halls of Fabrication Veteran Status Panel and Asylum Sanctorium Status Panel by code65536. This feature is still considered beta and if you are experiencing problems with it you can disable it to prevent issues or conflicts with other addons with a similar feature. Through the use of sirinsidiator's awesome LibGroupSocket (see the page for more details) it is now possible to share your ultimate with the rest of your raid. When this feature is enabled in the settings menu it will turn on sending your ultimate values during trials only. For now it displays people's ultimate as a percentage based on their warhorn cost but I plan to add support for other (relevant) ultimates. It does however, work with any ultimate cost reduction passive and/or sets and it doesn't matter if the person actually has warhorn slotted or not! As a user/receiver you can configure to only show it for certain roles, like tanks and healers and have the option to colorize the text once it reaches certain thresholds (80% and 100%). The window can be dragged around and can be hidden for the user while still allowing that person to share his ultimate. More customization will come in the future. Warning: Due to how it is currently written it will cause issues with other addons that use map pings to communicate (even the ones that also use LibGroupSocket) and will make it likely that you are kicked from the game due to hitting the message spam limit. From personal experience, when only using Raid Notifier's sharing feature I have never been kicked due to spamming. Each alert can have its own sound and many of them can be configured to display it for everybody and not just for you. You can see a full description for each alert in the settings menu. Of course each and every alert can be disabled. - Custom notifications are now default - Center Screen Annoucement is obsolete. - Added counter for shards and group number in Cloudrest. - Quick fix for new annoucement container blocking mouse input under certain circumstances. 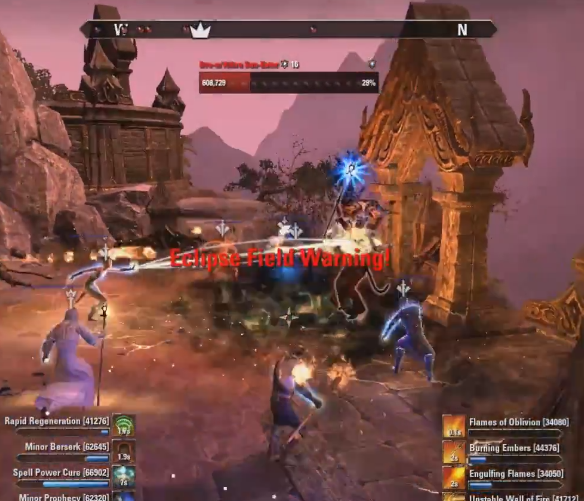 - Fixed pre-overload countdown not working due to ZOS changes. - Fixed hoarfrost not fully working due to ZOS changes. - Fixed roaring flare in execute not properly merging the two notification anymore. - Fixed hoarfrost drop notification from appearing when it is dropped for the third/last time. - Removed debug spam about missing text with the hoarfrost synergy notification. - Fixed notification when hoarfrost is dropped not appearing at all. - Removed some debug log stuff I forgot to remove in previous version. - Fixed countdown not appearing for overload if you got it after a player died from it. - Disabled the Roaring Flare tracking arrow in execute. - Added option to show an arrow pointing to the player with Roaring Flare. Arrow rotates around the reticle, more options will be added. - Fixed hoarfrost countdown being wrong half the time. - Possibly fixed a possible problem of hoarfrost not working for the 2nd person in execute. - Added option to turn hoarfrost notification into a countdown until you can drop it. - Just a re-upload to fix packaging error. - Added support for Cloudrest trial. - Stoneform alert on the Warrior (vHRC) is now working again. - Temporarily removed the Stoneform alert on the Warrior and added some debug code to figure out how to fix it. - Added a failsafe to the alerts about other players for when it fails to detect who's involved. At the very least now you'll still get the alert, just with a strange number instead of the name. - Added a few more sound options for alerts. - Completely changed the way foodbuffs are being detected and is now future-proof. It may also increase performance a little in heavy raid fights. - Added functions to LibCSA for changing the countdown tick sound. - Fixed bug in settings code that checks for updates to setting types. - Added option to chose what type of CSA line to use. - Added option to display user names in alerts. - Protector spawn in Asylum is now when they actually spawn instead of when they start shielding the boss. - Several changes to the "Taking Aim" countdown setting. It no longer requires DevMode and it now has the option to grab the channel duration from the game itself. A custom duration is still possible and if you have a duration that is different from the default it will change the setting to "Custom" upon startup. - Fixed "Defiling Blast" notification not always showing up (thanks code65536). - Added option to show username or character name on ultimate exchange window. - Added option to unlock status display icon and move it on the screen. - Quick bugfix that should fix issue with countdowns not appearing due to some settings using an old format. - Added keybind for toggling ultimate sharing. - Tweaked some debugging code. - Changed how Raid Notifier listens to the combat event, should increase performance but may not be noticable. - Added "Storm the Heavens" and "Exhaustive Charges" from Saint Olms in Asylum Sanctorium. - Changed how Raid Notifier alters its countdowns to not affect other countdowns. - Fixed debug code using the outdated variable. - Reverted changes to UltimateHandler.lua while I investigate issues. - Fixed possible chat spam due to the ultimate sharing. - Removed the code that stops active countdowns after boss fights due to some issues from time to time. Hopefully fixes issues in vHoF first bosses. - Any countdown will be stopped once a boss is killed or gets reset. - The countdown from Taking Aim in HoF is stopped when the sphere is interrupted or dies before it finishes the attack. - Fixed some logical issues with the Taking Aim settings which led to the countdown always appearing. - Added basic support for the new trial on PTS, it is recognized as a trial but there aren't any notifications yet. - Removed unused ResourceHandler file from LibGroupSocket folder. - Fixed settings menu not being localized properly. - Added empty placeholder for german translation due to it being severely out of date. - Fixed Serpent World Shaper still depending on DevMode outside of the settings menu (memus). 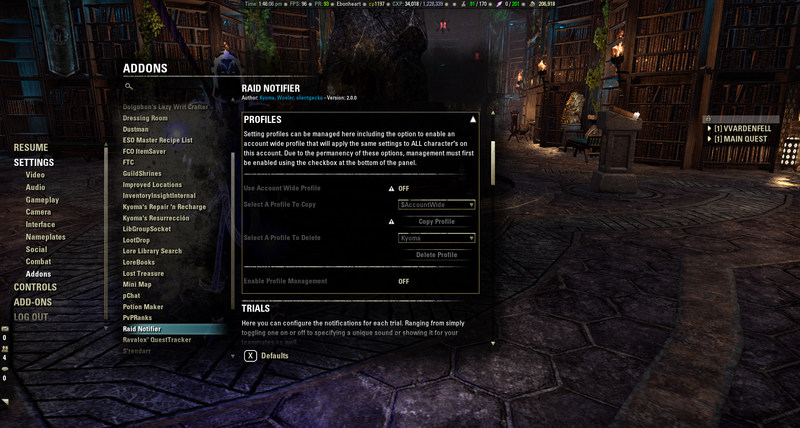 - Fixed Draining Ballista notification in HoF not using the player's name when shown for others (memus). - Add alternative countdown mode for Taking Aim in HoF. For now only applies if setting is "Self". (memus). - Moved DevMode setting to the top of the menu to make it easier to find. - Removed DevMode for Serpent World Shaper. - Ultimate window will now be hidden when you aren't grouped. - Ultimate sharing will now be disabled when you leave a group and enabled again when you join a group. This is the actual sharing from LibGroupSocket, the setting from Raid Notifier will remain active until you leave a trial or turn it off manually. - Fixed UI error when just typing "/rnulti"
- Actually added the Venom Injection status in HoF to the settings menu. - Fixed glyph cooldown in Maw of Lorkhaj being in milliseconds instead of seconds. - Added aspects display at the False Moon Twins. - Disabled the Lunar Bastion notifications due to changes with how the effect is reported to addons. Currently investigating if I can work around it. - Fixed error when no other addon was active that loaded LAM's divider.lua. - Changed the countdown for HoF's 4th boss to a configurable one. For now the default is 5 seconds but will be tweaked in the future. - Implemented a "default sound", as such, all alerts that had the previous (hardcoded) sound of "CHAMPION_POINTS_COMMITTED" have been changed to the default sound. - Removed UI namespace as it was cluttering everything up. - Restructured the UI code and turned the scalded display into a more generic status display. - Removed devmode from Yokuda Meteor alert in Hel Ra Citadel. - Added status display for aspects at twin bosses in Maw of Lorkhaj (still untested in actual boss fight). - Added status display for Venom Injection from the spheres in Halls of Fabrication Hunter bosses (untested but should work). - Added base code for status display of the spreading poison from trolls in Sanctum Ophidia (not actually implemented yet). - Adjusted delay for Sanctum World Shaper countdown, should now be safe to move as it reaches zero. - Ultimate can now be shared outside of trials, use the "/rnulti" command in chat to toggle it on and off. - Some underlying changes to the settings menu for future additions. - Changed how the UI fragment is handled to allow the Ultimate Window to be used outside of trials. Use "/rnulti on|off". - Added "Dev Mode", a master switch for new code or additions that might not (yet) fully work as expected. Features that depend on it will be marked by this in the changelog. - Temporary disabled non-english translations due to them being severly out-of-date. - Expanded the "/rndebug" and "/rnulti" chat commands. - Fixed a few more typos with the achievement check on 4th bosses in HoF. - During a countdown all other messages are now displayed through our own static alert (temporary fix). - Removed some debug code and added override cost to /rnulti. - Added profile management (all credits to S'rendarr authors). - Implemented "[Planned Obsolescence]" achievement failed check. - Tweaks to some of the strings. Probably more of this in the future. - Added option to override ultimate cost. - Fixed a few alerts not working for "All". - Alot of code for future HoF alerts (disabled for now). - All settings related to Ultimate Exchange should now be applied right away. - Fixed UI error when trying to change the sound for an alert. - Major refacturing of code, cleaning it up and fixing some (minor) potential issues. - Changed how raids are detected and it will now work in normal trials as well. - Fixed bug with Twin Aspect boss in Maw of Lorkhaj where it wouldnt inform you when conversion ended. - Fixed more errors when it tried to deactivate your vanity pet. - Fixed a few settings not properly changing when you reset the addon to defaults. - Re-added the "Use Center Announcements" setting as it turns out quite a few people still used it. - Fixed (possible) UI error on startup. - Fixed issues with some alerts in AA just displaying the number for a string instead of the actual content. - Fixed some settings in Sanctum not properly stopping alerts when they were set to "Off"
- Each alert can now have its own seperate sound! Also opens up more customization per alert in the future. - Added alerts for gaining and/or losing the lunar bastion buff (the golden platform) at Rakkhat. - Fixed some alerts in AA displaying the string id instead of its content. - Added (hopefully) all missing food & drink buffs. - Default settings now have less options enabled to reduce the alert spamming a bit. - Fixed message spam at start of combat due to trying to de-activate assistants. - Added several alerts to AA, including the nasty Call Lightning. - Minor tweaks and fixes. - Updated to API v16 and latest libs. - Fixed bug with some events not unregistering properly when a trial ends. - Added several new warnings in Sanctum. - Added the Warrior's Stone Form in Hel Ra. - Added Rakkhat's Threshing Wings in Maw of Lorkhaj. - Began gathering info on AA, Hel Ra & DSA. - Re-arranged the settings menu and changed most alerts to be more uniform. - Bumped API version to 15. - Small but crucial fix for glyph window at Zhaj'hassa the Forgotten. - Added option to disable/hide assistants when combat starts (trials only). - Fixed glyph window showing up for all bosses instead of just for Zhaj'hassa the Forgotten. - Tweaked Grip of Lorkhaj code a bit again to reduce its spamming. - Fixed alert for sun-eater eclipse always being displayed if the target is nearby, regardless of the setting. - Fixed error with vanity pet code when none is active. - Fixed Grip of Lorkhaj alert not starting slightly before you actually get affected (as originally intended). - Added option for disabling vanity pets during trials. -- Marked for Death from the panthers and Colossal Mark from the big panthers. -- Grip of Lorkhaj (curse) from Zhaj'hassa the Forgotten. Plus an optional window displaying all cleaning platforms and their respawn time. - Switched from CSA_EVENT_COMBINED_TEXT to CSA_EVENT_SMALL_TEXT so multiple messages can be visible at the same time. - Fixed typo for Twin Aspects causing an error each time the announcement would be shown. - Fixed several situations where the addon would stop working or would not properly start. - Maelstrom Arena error should truly be fixed now. - Added the recent strings to the language file (german text not yet added but the addon will still work). - Minor code changes and optimizations for future additions. Yes there was stupid issue in 2.9. Try new one. Last edited by Julian001 : 04/03/19 at 04:29 PM. problem with the pad display in MAW first boss. it throws errors everytime someone walks on the pad but stops if you can get cleansing platforms shut off (very hard to get it to shut off since it errors trying to shut it off. We found that if you turn off "grip of lorkhaj" then back on it will turn off cleansing platforms and fix the error). Last edited by choekstr : 04/01/19 at 07:19 PM. Last edited by baratox : 03/16/19 at 04:16 AM. Hey there, thanks for making such an awesome addon, if I have not said so before! One thing to report that has been happening for a while: It does not re enable pets after exiting a trial. Is there something I have to do to fix this in the settings itself? Or a known bug with the addon? Edit: Ok new version is up. Hi, the latest version of this mod sadly is creating an invisible frame that you can't klick though. This is causing problems with addons like Dolgubon's Lazy Set Crafter because you can't select anything in the menus when its behind this invisible frame you create. I hope you can fix this soon. Thank you for the addon! I can't reproduce this, anything you can add? I assume you've made sure it is due to RaidNotifier by disabling it? Alright, will get to work and see if I can figure it out. It's always tricky when something cannot be reproduced locally. One more thing, this happens immediately after a reloadui or is there a trigger for it happening? immediately after a reloadui all I do to test it is open the set craft window with the keyxbinding in the exact position where the Announcment window woud be so that the dropdown menus are behind. Last edited by Kyoma : 10/14/18 at 06:06 PM. Last edited by Tonyleila : 10/13/18 at 04:21 PM.